Crude plumbs new depths… update on a plumber’s plight… the old length-of-The 5 debate renewed… and more! We begin a new week mindful of market turmoil, collapsing oil prices and — of course — the Most Important Fed Meeting EVAR™… but we’re also eager to stand back and examine a much bigger picture. Is there any doubt? Bankers don’t create wealth — they just move money around (and take their own generous cut). Lawyers don’t create wealth — at best, they can help you hang onto the wealth you’ve got. Facebook doesn’t create wealth — “mining” your data to sell to advertisers doesn’t count. 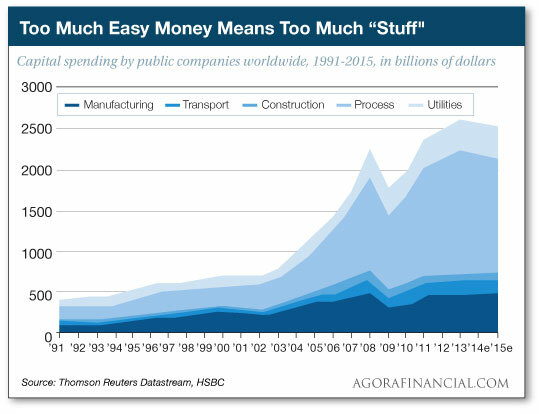 New wealth — the stuff of an improved standard of living — comes from growing, mining or manufacturing something. Now consider this: A two-decade monetary bender by the globe’s central banks has left us with a massive, overwhelming surplus of “new wealth” — of mined and manufactured goods. You see it everywhere. You see it in the empty skyscrapers — heck, empty cities — of China. You see it in the mining giant Anglo American’s plans to slash 85,000 jobs, two-thirds of its workforce. Here in the United States, you see it in a shrinking factory sector, the ISM Manufacturing Index now its lowest since the end of the “Great Recession” in mid-2009. “We believe,” says David, “the global economy is vastly bloated with debt-based spending that can’t be sustained. And that this distortion is compounded on the supply side by an incredible surplus of excess production capacity. As well as wasteful malinvestments that were enabled by dirt-cheap central bank credit. “Consequently, the world economy is actually going to shrink for the first time since the 1930s,” David declares. “There has been so much overinvestment in energy, mining, materials processing, manufacturing and warehousing that nothing new will be built for years to come. The boom of the last two decades essentially stole output from many years into the future. That’s bad enough. This is worse: “Sharp curtailment of the capital goods industries has far more destructive implications for the macroeconomy than a reduction in consumer appliance sales or restaurant and bar tabs,” David explains. 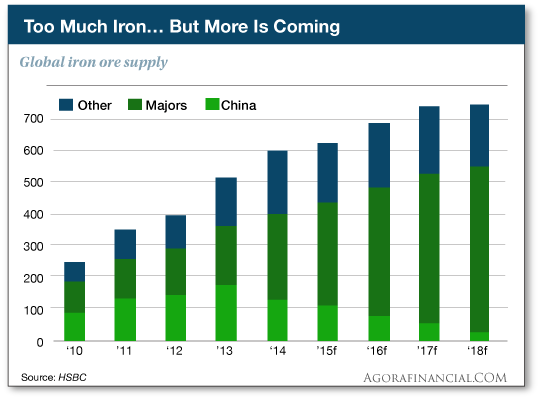 For early evidence of how all this will shake out, look at iron ore — where the crash of prices and profits has already taken place. “This is because of massive excess capacity recently installed in Australia, Brazil, China and elsewhere,” says David. “Prices are down from a peak of $200 per ton to under $40 per ton, and are likely heading for $20 next year. “That’s a 90% plunge, and it means that half of the global industry will soon be in bankruptcy. “Yet according to HSBC estimates, new capacity will keep growing until 2018 based on what is already in the pipeline and committed to completion by the majors! As long as David brought up oil… West Texas Intermediate crude broke below $35 a barrel this morning. The December 2008 low of $32.40 isn’t far away. Brent crude, the global benchmark, has broken below $37 a barrel — only 50 cents above its Panic of ’08 lows. “The graph below gives some hint of the massive downturn that lies ahead on a worldwide basis,” David goes on. “During the last 25 years, capital expenditures (CapEx) spending by the publicly listed companies of the world grew by an incredible 500%. And much of this happened in China and the emerging-market (EM) economies, and in the transportation and distribution infrastructure that connects them. “Yet this massive explosion of investment spending didn’t happen because several billion Asian peasants suddenly decided to save up a storm of new capital. “Instead, this unprecedented construction and CapEx campaign was financed almost entirely by a massive issuance of printing press credit at virtually zero real interest rates. “Healthy capitalist investment based on market prices and savings set aside from current income can go on indefinitely, fueling rising efficiency, output and wealth. Payback — at the very moment the Fed is looking to raise its benchmark fed funds rate from the Panic of ’08 lows! As you’re surely aware by now unless you live under the proverbial rock (in which case, we envy you), the fateful decision comes on Wednesday. 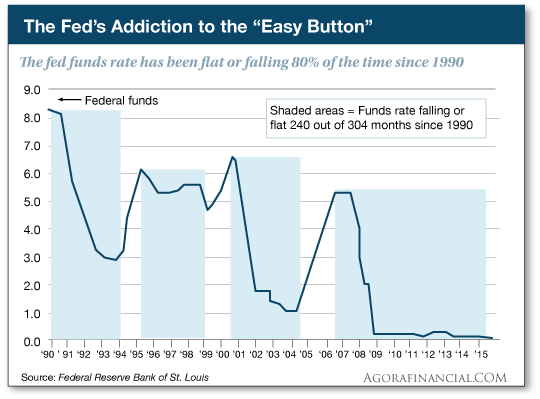 David is fond of saying the Fed has spent the last quarter century routinely pushing the “Easy Button.” Nearly 80% of the time, the Fed has either been cutting the fed funds rate or leaving it unchanged. “The professional gamblers in today’s Wall Street casino have no real experience of a time when the ‘The Fed is your friend’ adage failed to work,” David sums up. “After 84 months of zero interest rates… the Fed has run out of time and excuses. But if the Fed retains whatever credibility it still has and raises rates, that will have its own knock-on effects. That’s what the freakout in the junk bond market is all about. On Friday, as we were surveying the damage from the collapse of a junk bond fund here in The 5, junk bond funds notched their worst day since 2011. And then what? The longer the oil price stays depressed, the more likely it is the energy firms that issued those junk bonds will default. Then the banks that lent them the money will be on the hook. And if the banks are too leveraged up — a likely scenario — we’re looking at another 2008-type crisis. Maybe worse. Everyday investors stand to see their portfolios cut in half — again. As we said last week, David is so concerned about the fallout of the Fed’s decision that he’s come out of retirement. Tonight, he will lead an online workshop exclusively for Agora Financial readers like you. He’ll unveil a unique investment strategy that will present you 25 opportunities to make 300% or better over the next year. You can get a glimpse of this strategy during the workshop. It’s scheduled for tonight at 9:00 p.m. EST. That way you’ll have time to start executing the strategy before the Fed announcement on Wednesday afternoon. Just shoot us your email address and you’re guaranteed a spot. Click here to learn more and sign up. After Friday’s big drop, the major U.S. stock indexes are… registering a little drop. The Dow is holding up best, shedding 45 points on top of Friday’s 300 — holding the line on 17,200. Small caps are looking worst, the Russell 2000 down three-quarters of a percent. Bonds are also selling off today, the 10-year Treasury yielding 2.19%. Gold is losing ground at $1,069. Even the dollar is down relative to other major currencies, the dollar index at 97.4. China is acting to avert the fallout from a Fed rate increase this week, pledging to de-peg its currency from the U.S. dollar. Meaning? “The Chinese are going to allow a large depreciation of the renminbi,” Chuck explains, “and what better way to accomplish that than to align the renminbi with currencies that are getting hammered by dollar strength right now? In the meantime, the move has brought more renminbi weakness — trading overnight at a four-year low against the dollar. And now a 5 follow-up on the unfortunate small-business owner from Texas City, Texas, whose truck wound up in a Syrian jihadi video. It wasn’t ISIS, but rather the Ansar al-Deen Front. 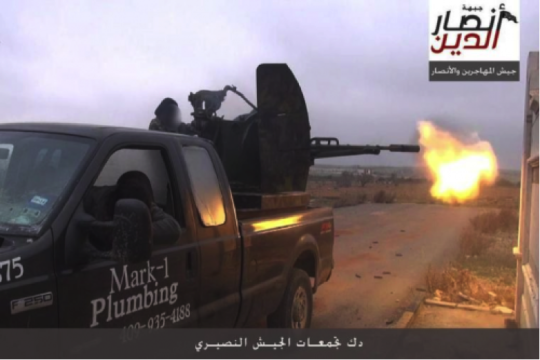 Our cursory research is unable to determine whether Ansar al-Deen is one of those “moderate” jihadi groups the White House is so fond of… but the distinction mattered not to the knuckle-draggers who had nothing better to do with their time than to flood the plumber’s phone line with profanity and/or death threats. “By the end of the day, Mark-1’s office, Mark-1’s business phone and Mark’s personal cellphone had received over 1,000 phone calls from around the nation,” says a lawsuit Mr. Oberholtzer has now filed against AutoNation. He’s seeking a minimum of $1 million. The 5: Heh, this question comes up every few months as we add new readers. It depends on how you read it. Many people take advantage of the clock and the boldface sentences to “edit” as they go. We cover a lot of territory in a given week, and not everyone will be interested in every topic. But if you really do want to take 10 minutes to read it start to finish, we’ll take that as a sign we’re holding your interest — which is, after all, our fervent hope. P.S. As we get closer to virtual press time, the market’s “fear gauge” has reached a high last seen in late September. The VIX — the volume of S&P 500 index options — just touched 26 after spending most of October and November in a range of 15-20. Nearly everyone expects the Fed to raise rates on Wednesday. It’s what happens afterward that has everyone so nervous. As mentioned earlier, David Stockman believes it signals the end of an era — and the start of an episode in which the global economy will shrink for the first time since the 1930s. We urge you to sign up for David’s free online workshop tonight. You’ll learn about a strategy presenting 25 opportunities to make 300% or more over the next year… while everyday investors are destroyed just as they were in 2000 and 2008. It’s tonight at 9:00 p.m. EST. It’s free. There’s no obligation. Just leave us your email address so we can make room for you. Here’s where to sign up for access.